With so many sports cards sets to collect, it's important that each finds a voice. They need something unique that helps them standout. 2012-13 Panini Threads Basketball is taking that approach with a couple of aspects, the most notable of which are autographed rookie cards printed on wood stock. The set arrives with the promise of three autographs and one memorabilia card in every box. 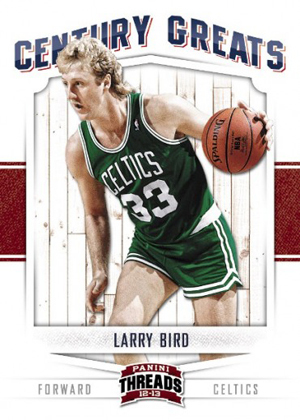 2012-13 Panini Threads Basketball has a 150-card base set. In addition, there are 100 of the autographed rookie cards. As with all 2012-13 Panini basketball products, they span both the 2011-12 and 2012-13 rookie classes. With so many rookies to chase down, individual players should prove to be a challenge. Another unique aspect to 2012-13 Panini Threads Basketball is the Team Threads Autographs. The die-cut cards are shaped like a player's jersey, giving them a look that's significantly different from other signature cards. While card fronts don't have a player photo, they do have the player's number to make them identifiable. 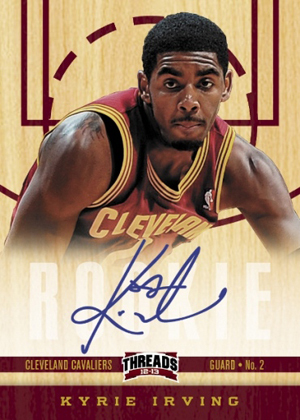 Other autograph inserts in 2012-13 Panini Threads Basketball include Rookie Team Threads Autographs, Signage, and Private Signings. Despite the name "Threads," memorabilia cards take a bit of a backseat. Inserted one per box, sets include Authentic Threads and Triple Threads. Collectors can look for both basic and patch versions. Retired greats are featured in the Century Greats insert set. 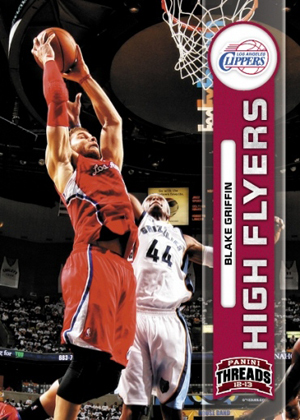 High Flyers looks at players who seemingly take flight on a regular basis. Get a real-time look at the 50 most-watched 2012-13 Panini Threads Basketball cards on eBay. Good: Five-card pack of Kobe Bryant Anthology cards inserted in every box, three autographs and one game-used card per box, autographs are signed on-card, rookie autographs on wood card stock, first cards of Dwight Howard, Steve Nash, Ray Allen, Jason Kidd, Andre Iguodala, and Jeremy Lin in their new team uniforms, first Steve Nash Lakers Autograph, Team Threads die-cut jerseys return. Bad: Some players who changed teams this past offseason are not shown in their new uniforms. Andre Iguodala has an insert with his new Nuggets uniform, but his base card shows him with his old 76ers jersey. With the exception of the Jason Kidd, there are no other base cards from anyone on the Brooklyn Nets, New York Knicks, or Portland Trailblazers. Takes more than 1 box to complete full 150 card base set. 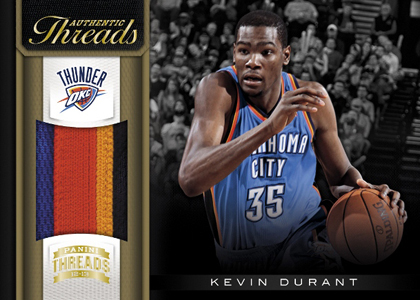 The Bottom Line: 2012-13 Panini Threads Basketball is an affordable mid-end product. Collectors who have been anxiously waiting to get their hands on the next iteration of the Team Threads insert as well as their autograph counterparts can rejoice. Lakers fans will no doubt love the first base cards of Dwight Howard and Steve Nash donning their new Lakers jerseys. The Threads base card design is usually one of the nicest of the year. This year's set is similar to 2003-04 Upper Deck, which is one of my favorites. The base cards have three parallel versions: Silver, Gold, and Platinum. The only difference is the color on the bottom of the card. They are also serial numbered. There are several different inserts in this product. 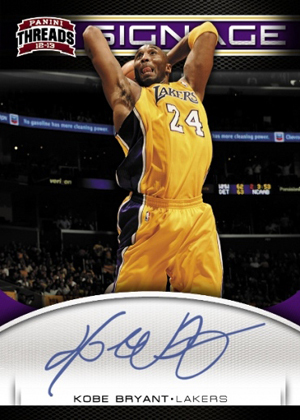 Returning is the Kobe Bryant Anthology, a 200-card set which will be inserted in all 2012-13 Panini basketball products. Century Greats inserts look very clean and crisp with a solid white background and the player clearly focused in the center of the card. Floor Generals showcases point guards doing what they do best. I don't really like this particular card design as it seems that it will be better suited in Hoops instead. High Flyers highlights some of the top dunkers in the NBA. The cards of Kevin Durant, Russell Westbrook, and DeAndre Jordan look superb. Inside Presence reflects the NBA's top big men and is the worst-looking design in this whole product. This is another insert set better suited for the Hoops product. Talented Twosomes focuses on teammates and has lots of great photography. Team Threads is always a favorite and one of the main selling points of the product. The popular die cut jersey design was first introduced by Fleer with the 1996-97 Ultra Fresh Faces and again with 2000-01 E-X E-Xciting. Panini was smart to make this insert a staple in Threads. There are home and away versions for veterans and rookies, making a challenge for set builders. The Authentic Threads game-used relics come in single swatches, multi-colored patches, and triple player variations. These designs are very generic and not the best ones they could have produced. Autographs are all signed on-card and come in many different variations: Base Rookie Autographs, Autograph Team Threads, Signage, and Private Signings. The Base Rookie Autographs are signed on wood card stock and look amazing in person. This is a very unique innovation to use a wood design and feel on the card. It makes the card stand out more. Team Threads Autographs has signatures from all the main rookies and several big name veterans and comes in home and away uniforms. This is a genius idea that Panini gets a slam dunk for. The base set is comprised of 150 cards. There are 100 rookie autographs covering both the 2011 and 2012 NBA Draft classes. This product really takes a hit in the checklist area for the base cards, even though the autograph checklist is full of top-tiered talent. With the exception of the Jason Kidd Knicks base card, there are no other base cards from anyone on the Brooklyn Nets, New York Knicks, or Portland Trailblazers. How do you include only one total card from three teams? There are no Carmelo Anthony, Jeremy Lin, Amar'e Stoudemire, or Deron Williams base cards. Insert cards from those teams are present, but it seems really weird that Panini made a base set where two teams were left out completely and another almost completely ignored. For less than $100 you get three autographs and a game-used card per box. Rookie Autographs come in either a wood card stock design or the Team Threads die-cut jersey design. 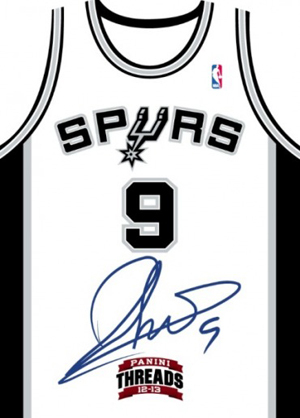 The autograph checklist from this product is top-tier with names like Kyrie Irving, Anthony Davis, Kobe Bryant, Blake Griffin, Magic Johnson, Larry Bird, David Robinson, and Steve Nash in a Lakers uniform. Panini Threads has been one of my favorite basketball products since Panini started releasing basketball cards three years ago. Like Prestige, collectors have a chance to pull rookies from two different draft classes. The rookie autographs in this product are look spectacular. The wood card and die-cut jersey autographs are huge selling points that should drive collectors to the product. I realize the Trailblazers are going to be lousy this year, but how can you produce a 150 card base and not have a single Blazer card? How can you eliminate a team? We love this new product from panini. The on card on wood autograph has a very nice feeling to it. Great job by Panini and staffs. The Signage really pops out. Its clean and well thought deep checklist is really nice. Price to value is great. The century stars is the cream of the crop of this product. Beautiful and lovely designed. Must have to any basketball collectors! I love the on card wood RC autos! Love the mix of rookies and vets on the auto checklist. This is going to be a great year to collect NBA cards from Panini!! I have to give an average product rating to any of Panini’s NBA products. It’s like exactly average is their target for every uninspiring set design they put out. Real wood auto cards and jersey diecuts are the only highlights of just another product from Panini. And the wood and jerseys themselves fall just short of their potential not in their design but in material and finish. This box is a little difficult to judge in that there is many cards, not so many desirable cards, and the desirable cards are really really great. I just haven’t been able to pull anything good out of these boxes. They are mediocre. Unless you’re a set builder, steer clear of these. Loved the base design of the cards and the on card rookie wood autos are beautiful. Only bad for me was that those rookie on wood autos were not numbered, but that’s just a personal preference. My Pack came with a piece of plain fiber board in it? Carl � This is actually fairly common. They’re called decoys and they’re meant to throw off people searching for thicker premium cards like jersey cards. It shouldn’t have replaced a card in your pack. Have only done one box break of these and had 5 hits 1 Signage,2 RC Autos, 1 Authentic Threads (LeBron), and 1 Private Signings (Ellis).I am pleased with the product. If there were an option of giving 0 stars, I would select that instead. This is the worst crap I’ve ever seen. Not a single insert in 10 packs. Not even a plain old rookie card! It’s pathetic. Poor design, brittle foil on the bottom and corners – which makes the cards easily damaged. Absolutely 0 value for your money. Again, the absolute worst… as is the 12-13 Panini Absolute … Both are complete crap products. 2012-13 Panini Threads Factory Sealed Basketball Hobby Box Kyrie Irving RC?